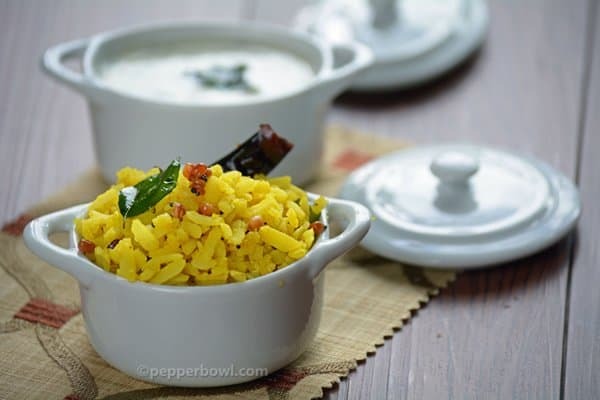 This Lemon Poha recipe is a great breakfast recipe which gives full feeling and can also be served in the evening for the kids who returns home hungry after the school hours. 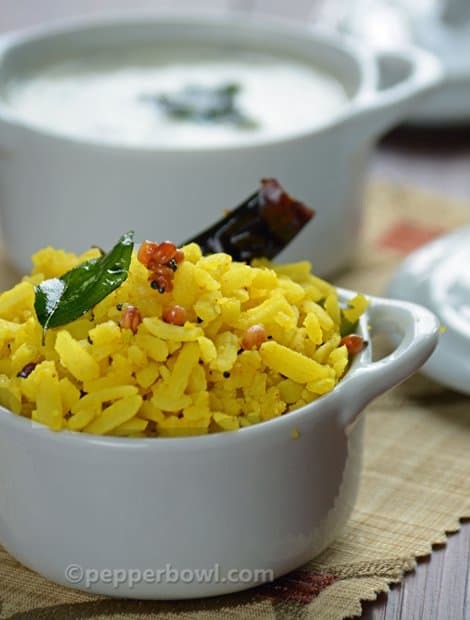 Thinking about an easiest yet delightful breakfast for the busy morning schedule, then Lemon / Neembu Poha can be one of your choices. Another catchy positive factor of lemon aval is, this is a ‘feel fuller’ breakfast. There are many varieties of aval is available in the market. So soaking period varies accordingly. Soaking has to be perfectly done. Over soaked and under soaked can give the worst results. Then how to know it is perfectly soaked? It has to be mashed when trying to mash them in between the fingers. The second factor in determining a perfectly soaked is, it has to retain its shape and structure when squeezed out the excess water. Do not forget to check into other interesting breakfast recipes like, Paal Kozhukattai, Neer Kozhukkattai. If your are deciding this recipe in the last for the breakfast, then soak aval in warm water for about 10 min. This can also give the same result as above. 1. Soak poha/aval/beaten rice for about 20 min. Drain and squeeze out the excess water. Soaking time varies for every type of aval. So decide it accordingly. So, check it in between as over soaked aval would lead to a mushy dish. 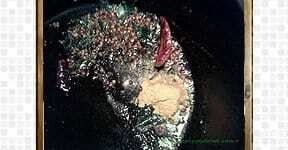 The squeezed out aval should retain its shape and structure but very soft and moist. 2. In the medium flame, heat oil in the pan, add mustard seeds followed by urad dal, cumin seeds, asafoetida, red chilies and curry leaves. Wait till mustard splutters, urad dal becomes golden brown. 3. Reduce the flame to the maximum and add lemon juice and turmeric powder and saute it for a minute. Immediately add salt and the squeezed out aval. Otherwise, lemon juice can turn bitter and turmeric powder would get burnt. 4. In the medium flame, gently saute the aval mixture for another couple of min till the aval gets completely turns yellow and coated with lemon juice. Make sure at every point, the aval should not turn mushy. Serve preferably with coconut chutney. 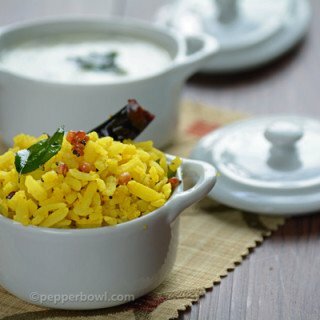 Lemon Poha recipe is a great breakfast recipe which gives full feeling and can also be served in the evening for the kids who returns home hungry after the school hours. Soak poha/aval/beaten rice for about 20 min. Drain and squeeze out the excess water. Soaking time varies for every type of aval. So decide it accordingly. So, check it in between as over soaked aval would lead to a mushy dish. The squeezed out aval should retain its shape and structure but very soft and moist. In the medium flame, heat oil in the pan, add mustard seeds followed by urad dal, cumin seeds, asafoetida, red chilies and curry leaves. Wait till mustard splutters, urad dal becomes golden brown. 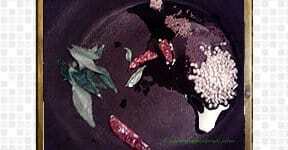 Reduce the flame to the maximum and add lemon juice and turmeric powder and saute it for a minute. Immediately add salt and the squeezed out aval. Otherwise, lemon juice can turn bitter and turmeric powder would get burnt. In the medium flame, gently saute the aval mixture for another couple of min till the aval gets completely turns yellow and coated with lemon juice. Make sure at every point, the aval should not turn mushy. Serve preferably with coconut chutney. Add peanuts or broken cashew to add more crunchiness.